Plainly speaking there is no right or wrong to you. You were born, just like the other trillions of humans who have been born before you. Likewise, your child will be born. This is a fact. You will go through the process of pregnancy, and at the end of it become a mother to this child. The universe has a way of unfolding regardless of human plans, and part of the allure for those of us who work with this elemental stage of the human experience is the wonder and mystery that still exists in the transition from womb to the outer world. Every single birth is an initiation for both the mother and the child; there is a transmutation from one state to another that can never be undone. Just like any ritual, and this is a critical point- there is physical, mental, and emotional preparation that must be done in order for you to be fully present in the birth process. Can you get yourself into that delivery room without preparation? Of course you can. But I’ll argue your experience of the rite is going to be vastly different. To paraphrase from the film Her, the truth of where a satisfying birth experience lay is somewhere in-between the words on the page. There’s a difference between expecting or visualizing a natural delivery and this centered state of being. There’s also a subtle distinction between “going with the flow” by allowing whatever outcome to unfold during birth, and this level of conscious preparation and presence. 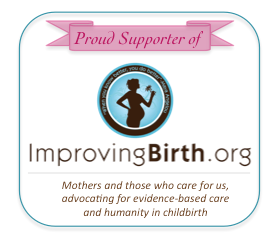 Where most mothers operate from during pregnancy is a place of conscious thought or subconscious emotion. Where I’m encouraging you to go instead is a state of mindfulness, a connection with the broader consciousness that you gain access to through rehearsal and by acting on clear, not muddled, messages from your intuition. The godmother of midwifery Ina May Gaskin says “Your body is not a lemon,” meaning your body is intelligent, and knows what to do during birth. As a chiropractor who primarily works with pregnant women and young children, I tell patients their bodies will always do the right thing if given the opportunity. The small print to these statements is that in order for the body to do the work that comes naturally, it needs to be receiving clear messages. The physical separation between the mind and body was an ill-conceived notion that dates back to Descartes, yet still persists in the practice of medicine. The truth is, there is no separation between your thoughts and your physiology. Science showed us that every time we have an emotion, our brains release chemical messengers that implant themselves somewhere in our bodies and change the tissues around them. Likewise, the more restricted the body, the less clear the thoughts. That’s why the adage “Fear is the enemy of labor” is so true. To clear your fear and worries, you need to know, and I mean really be present within, all delivery outcomes before you begin laboring. While it’s beyond the scope of this article, Birthing from Within is a fantastic resource for rehearsing and roleplaying. Doing it literally impacts your cells’ and hormones’ ability to function the way they should. For the next step, to clear the communication pathways between the physical structures of your brain and body, you do need to seek the help of someone who is trained to assess that balance. Years of studying, the late night partying of your wilder days, that time you fell off your bicycle as a child, or even the grief of losing your first cat has created webs of static in your nerve system and separated you from expressing the full potential of that innate intelligence inside. It’s your job as an expecting mother to transition from the busy-ness of life into the centered place in preparation for this birth ritual. It’s my belief that one of the things I do is get an expecting mom’s pelvis balanced and ready for delivery day so she and her baby can have a safer, more comfortable birth. But it’s also my job as a chiropractor to unlock the wisdom that’s lain dormant within her; to integrate not only her neurology, but allow for the smooth dissolution of her sense of separate individuality into the expanse of divine consciousness in preparation for the initiation into new motherhood. A chiropractic adjustment really can be that big. This is the preparation work every expecting mother should engage in at least 3 months prior to her baby’s arrival. The birth is going to happen; how you choose to prepare for that fact is entirely up to you.